Chicken sate vendor, Jogjakarta. It was 17th August – Independence Day – and the streets and footpaths of Jogja were streaming with people out be part of the festivities for the big day. Families with little kids waving their red-and-white flags lined up to see the parading soldiers, important looking dignitaries making speeches, gamelan orchestras, brass bands and drumming troupes, acrobats and school choirs. In amongst it all the street vendors seemed oblivious to the occasion. This woman squatted on the edge of the road, with the crowds flowing past her like a rock in the river. 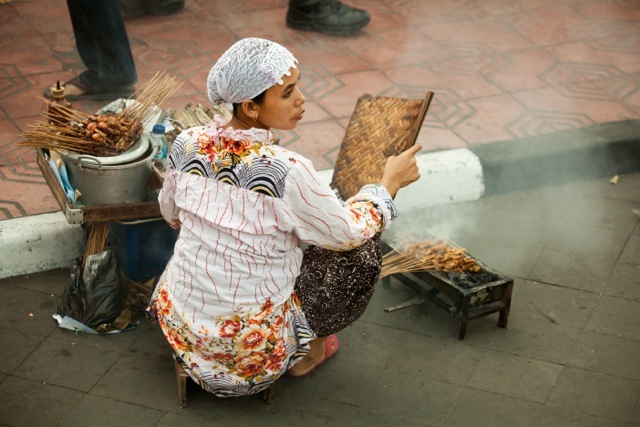 She fanned the embers of the coconut husk fire to cook the sate slowly, turning the skewers and looking around all the time for potential customers. The smoke wafted around, and smelt delicious, but no-one was buying. Sweet vendor, Jogjakarta. 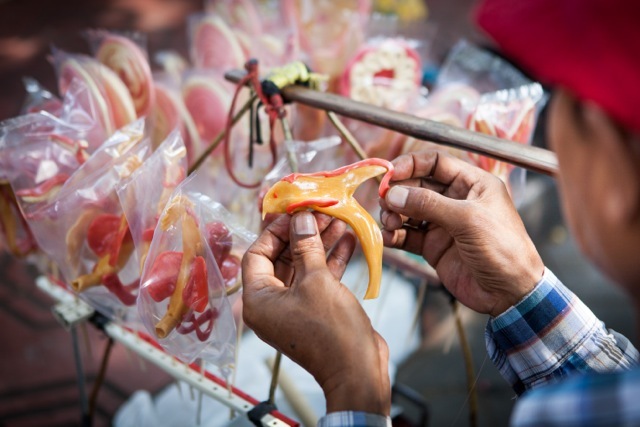 Another fellow was hand-making sweets out of sugary paste and food dyes, shaping the goo into elaborate shapes of dolphins, swans and butterflies, before putting each one onto a stick and sealing it in a little plastic bag. I didn’t see him get any sales in the hour or so that we stood nearby, but he seemed to be totally engrossed in his craft. Outside the Ceremony, Jogjakarta. 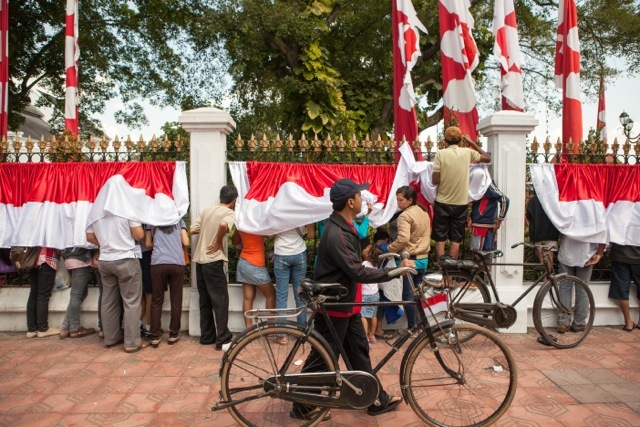 The main ceremonies for Hari Kemerdekaan (Indpendence Day) in Jogja were conducted behind a high fence in the palatial grounds of the local government official residence. Hundreds of VIPs, guests and military personnel were inside, but the masses of the general public could only look in from outside the grounds. This entry was posted in Indonesia and tagged Hari Kemerdekaan, Independence Day, Indonesia, Jogjakarta, Yogyakarta. Bookmark the permalink.